[A]: If you are into home cooking you are likely to have a few dishes up your sleeve for some unplanned cooking. Over the years I have gathered quite a few dishes that I can prepare pronto. This is one such dish. 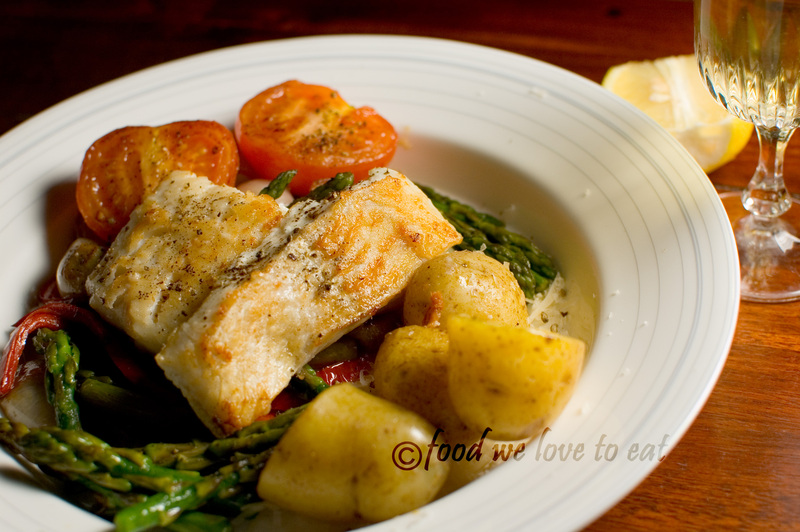 If there is some fresh white fish at hand, this is quite an easy dish to put together and is absolutely heartening as an evening meal. For this dish I wouldn’t supply measurements for the ingredients as it is quite easy to scale up or down depending on your appetite or the number of people you are cooking for. The vegetables for the medley can be decided based on availability. I tend to choose my vegetables based on colour and taste – vegetables that compliment each other in a medley. Here I have used baby potatoes to give some body to the dish, shallots for the sweetness, asparagus spears, sweet pointed peppers, vine tomatoes and a few garlic cloves. Remember that you may need to steam some of the vegetables to get them to a per-boiled state before you sauté them. The baby potatoes need to be in boiling water for sometime before they are ready. It is also worth just slightly steaming the asparagus spears if they are not too fresh. The fresh young ones can be directly sautéed though. Warm up a little bit of olive oil in a sauté pan over medium heat. Add the whole shallots first. These take about 5-8 minutes to soften down a bit. Then add the rest of the vegetables, except the tomatoes, and stir gently a few times till all the vegetables are softened. Make sure they are not too tender, as you would prefer a bit of crunchiness in your vegetables. Take the vegetables out of the sauté pan and keep them aside on a warm bowl. Take the vine tomatoes, cut into half and place them on the hot sauté pan used to cook the vegetables, the cut side facing the pan. All you need is to glaze the surface so that the juices are sealed in the tomatoes. The inside of the tomatoes will be ready as soon as the surface touching the sauté pan turns dark brown. Meanwhile get the fish (haddock/cod) ready. Cut the boneless, skinless fish fillets into pieces that suit your liking. I prefer big but thin fish pieces over small ones. Lightly dust all sides of the fish with a mix of plain white flour, black peppercorn powder and sea salt. Then shallow fry them in a non-stick pan with a little olive oil over medium-high heat – just a couple of minutes either side. On a warm plate, first arrange the vegetables to form a bed. Place the fish over the vegetable bed. Season with salt, pepper, some grated parmesan cheese and some fresh lemon juice. You may sprinkle some fresh chopped parsley too if you prefer. Voila! dinner is ready. This is a great simple dish where individual ingredients can express themselves fully. The taste of garlic, parmesan cheese, lemon and black pepper gives it quite a rich hearty flavour. It has become quite a popular dish at home and I am sure it will find a place in your repertoire if you try it yourself.